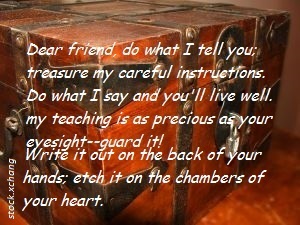 The Lord’s commandments are like a treasure to be kept locked in your heart. His teaching is worth more than any worldly possessions. Keep His words before you and within you. What influences you most; the world’s message or the Word of God? Interesting question for tonight. In the world of blogging, I must admit the nightly post that enriches my quest for the Word of God. What about you? I would like to say without a doubt or hesitation that the Word is my strongest influence all the time. But sometimes the message of the world is stronger. I am working on my discipline.